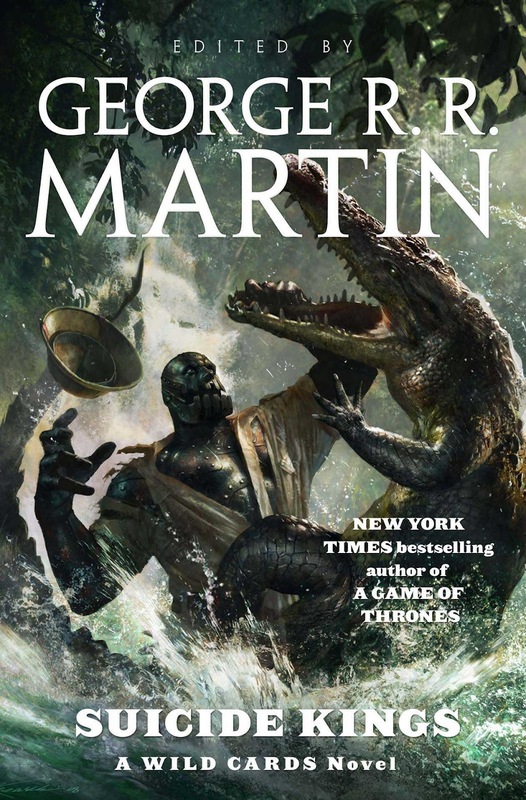 From his own blog (titled “Not a Blog”), George R. R. Martin reported that his incredible Wild Cards book series is under development by Universal Cable Productions (UCP), a division of NBC Universal, and a studio whose programs have been seen on USA, Bravo, E!, SyFy and Hulu. I was introduced to the books when they first came out in 1986, and was immediately hooked by a convincing world of superheroes and pulp adventures. I still read them voraciously today. Wild Cards was my standard to compare all other superhero fare. With programs like Heroes, Alphas and the various DC superheroes on TV, each was held up to the light against the Wild Cards series. And I’m here to tell you, none of them hold a candle to Wild Cards. The Wild Cards series (in case you haven’t visited here before), is an alternate reality that diverged from ours when alien scientists brought a human-mutating virus to Earth in 1946. Of those exposed to the virus, 90% died horribly, drawing the “black queen”; 9% were twisted and deformed into “jokers” or “deuces”; and a lucky 1% became blessed with extraordinary and unpredictable powers and became known as “aces.” The virus continues to pass among the population through present day (mostly as a sexually-transmitted virus), creating new aces, jokers and deuces that, like any other person, just want to find a way to live their lives… some as celebrities, some as full-time heroes, and some just eking out a living wherever they can be accepted. This incredibly rich and imaginative world of ace superheroes and villains, incredible jokers and disadvantaged deuces has been chronicled in over thirty novels, comic books, graphic novels and role-playing games, reprinted in many languages and featuring some of the best science fiction and fantasy writers of the last thirty years. It’s covered aspects of such characters that comic books will never discuss… but it’s also played a part in adding a grit and darkness to traditional comics never seen before. Universal Cable Productions has an impressive list of programming, including Mr. Robot (a current favorite), Colony, Playing House, Royal Pains, and Suits on the USA Network; The Magicians, 12 Monkeys, and Killjoys on SyFy; Girlfriends’ Guide to Divorce on Bravo; The Royals on E! ; Difficult People on Hulu; and Emmy winners Monk, Psych, and Battlestar Galactica (another favorite). So they sound like they can turn out a quality product, if they’re so inclined. And they will be working closely with Melinda Snodgrass, Martin’s co-editor on Wild Cards throughout its run. If I was involved in development (which, categorically, I’m not), I would use the contents of the first book, at least up to the 1960s or 1970s, for the entire first season, in order to provide the most comprehensive introduction to the Wild Cards universe as possible. So much of the real strength of the series is the backstory, the changes the wild card virus has made to history, the introduction of a new class of human beings, and the new attitudes that accompanied that. Without that, the series will be pretty hollow. In fact, the books are so packed with content that a traditional 26-episode TV season would be just about right for all of one or two novels, especially as each one is made up of individual stories, each featuring a group of diverse characters, who all come together at the end of the book for a big climax. It would be the kind of story Heroes tried to tell, but with limited success, especially after the first season. Of course, “in development” doesn’t always translate to a TV series; but this is one to root for, as the series did more to “adult-ize” superhero content than any other novels, and all comics except Watchmen and Miracleman. Read more about it on GRRM’s blog. And let’s hope this happens, people… it will be incredible.